Southeast Asia has no shortage of beautiful bays with emerald waters; yet, arguably none of them compare with Ha long Bay in the northeast of Vietnam. With countless large limestone rocks that jut out from the sea, along with the plethora of boats and sparkling blue water, the view across the bay is dramatic and unparalleled. Head for a high vantage point at sunset for the most incredible horizon. 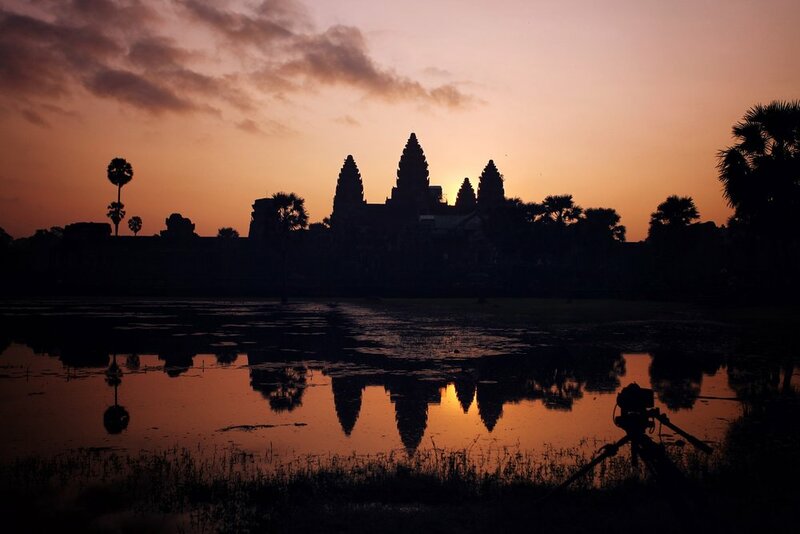 Angkor Wat is one of the largest religious monuments in the world. Originally built as a Hindu temple, it has since been adapted into an expansive Buddhist settlement. Surrounded by an extensive moat, the reflections of the spectacular architecture is cast back, giving the site a truly magical presence. It is by far the biggest tourist attraction in Cambodia, and it is easy to see why. Of course Bali has an abundance of breathtaking beaches, but you would be seriously missing out if you didn’t travel inland to experience this spot. Ubud, frequently referred to as the spiritual heart of Bali, is the ideal spot to relax and admire nature. Travelers to Ubud have the spectacular pleasure of seeing the unique balinese rice fields enveloped by palm trees. If you get the chance, aim to visit a rice terrace nestled in a valley like Tegallalang, that way you’ll feel completely immersed and engulfed by the surroundings. Most tourists are sure to make a pit stop in Hanoi, the capital, but the real gem in Vietnam is Hoi An, a beautiful coastal city. An array of eras and styles combine to make a very ‘instrammable’ backdrop. Expect to see architecture ranging from traditional Chinese houses made of wood to colourful French colonial buildings, as well as scenic canals cutting through the city. Time your trip to coincide with the Hoi An Lantern Full Moon Festival (which occurs every full moon) to not only capture great shots, but truly become immersed in a cultural event. The Phi Phi Islands near Phuket, Thailand, are the definition of paradise, but Ko Phi Phi Leh specifically has developed a worldwide reputation for its outstanding beauty, courtesy of its appearance in Danny Boyle’s The Beach. Hat Maya beach on Ko Phi Phi Leh has hence become an extremely popular tourist attraction. Unfortunately due to environmental issues caused by mass tourism, a decision was made last year to close the beach to tourists; however you can still see the stunning bay from the boat and enjoy some fantastic snorkeling. Bagan is an ancient city in Myanmar (formerly known as Burma). What is so impressive about this sight is the sheer amount of temples, stretching out as far as the eye can see. Hot air balloons have become especially popular with tourists, providing explorers with both an unbeatable view and a smashing photo opportunity. You don’t get any better than this! Take a sunrise flight and prepare to be mesmerised as the early morning sunshine glistens through the haze. Pink is becoming a very popular colour on many influencer’s Instagrams, and for those of you looking to put a pop of colour in your feed, the Putra Mosque is a must see. Pink on the outside and inside, this mosque is eye catching and contemporary: it was only built in the late 1990’s! From the outside you’d be tempted to recommend it to Wes Anderson for his next movie, with its rose tinted granite making a perfect reflection in the surrounding still waters of the man-made Putrajaya Lake. This sight, known to most foreigners as the White Temple, is actually a contemporary art exhibition first opened to the public in 1997. It is privately owned, and the project is still ongoing, but it is already truly a masterpiece. The space is bright, with the white temple-like installation reflecting the sun to the point where it seems to glisten. In fact, shards of glass have been incorporated into the plaster, which gives it this shimmering ethereal effect. The ultimate place to pose for a photo! The Temple Of Lempuyang Luhur has two towering stone pillars, known as ‘the gate’s of heaven’, perfect for standing in between and staring into the distance (on a less cloudy day the view is even more impressive, with a towering mountain in the background). Expect a queue for this Instagram-worthy photo opportunity as every tourist is angling for it! The view as you hike down to Kelingking Beach is even more instragrammable than the beach itself, so if you’re not the adventurous type then you almost needn’t bother with the trek all the way down. The steps are steep and precarious, but if you make it to the bottom you’ll reach a secluded white sand beach, the ideal spot to enjoy a dip in the turquoise waters. And these spots are just the tip of the iceberg! Southeast Asia has countless incredibly photogenic spots which are sure to add excitement to your feed. Which one is top of your must-see list?